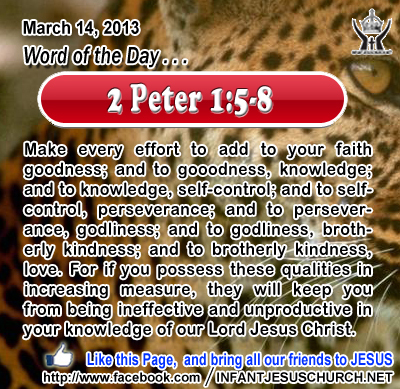 2 Peter 1:5-8: Make every effort to add to your faith goodness; and to gooodness, knowledge; and to knowledge, self-control; and to self-control, perseverance; and to perseverance, godliness; and to godliness, brotherly kindness; and to brotherly kindness, love. For if you possess these qualities in increasing measure, they will keep you from being ineffective and unproductive in your knowledge of our Lord Jesus Christ. Heavenly Father, we are going to put out the effort to grow in your grace. Please bless our efforts and receive them as our heartfelt appreciation for loving us when we were unlovable and redeeming us when we were lost. We want to be productive to your glory in our life with Jesus, in Infant Jesus name we pray. Amen. 1731 If I bear witness to myself, my testimony is not true; 32 there is another who bears witness to me, and I know that the testimony which he bears to me is true. 33 You sent to John, and he has borne witness to the truth. 34 Not that the testimony which I receive is from man; but I say this that you may be saved. 35 He was a burning and shining lamp, and you were willing to rejoice for a while in his light. 36 But the testimony which I have is greater than that of John; for the works which the Father has granted me to accomplish, these very works which I am doing, bear me witness that the Father has sent me. 37 And the Father who sent me has himself borne witness to me. His voice you have never heard, his form you have never seen; 38 and you do not have his word abiding in you, for you do not believe him whom he has sent. 39 You search the scriptures, because you think that in them you have eternal life; and it is they that bear witness to me; 40 yet you refuse to come to me that you may have life. 41 I do not receive glory from men. 42 But I know that you have not the love of God within you. 43 I have come in my Father's name, and you do not receive me; if another comes in his own name, him you will receive. 44 How can you believe, who receive glory from one another and do not seek the glory that comes from the only God? 45 Do not think that I shall accuse you to the Father; it is Moses who accuses you, on whom you set your hope. 46 If you believed Moses, you would believe me, for he wrote of me. 47 But if you do not believe his writings, how will you believe my words?" Jesus declares that the scriptures themselves, including the first five books of Moses, point to him as the Messiah, the Assured Savior. The problem with the scribes and Pharisees was that they did not consider what Moses had written. They desired the praise of their fellow humans and because they were so focused on themselves, they became blind sighted to God. They were so worried with their own position as authorities and interpreters of the law that they became hardened and unable to appreciate the word of God. Their pride completed them deaf to God’s voice. Scripture tells us that God reveals himself to the humble, to those who trust not in themselves, but who trust God and listen to God's word with a keenness to learn and to obey. The Lord Jesus reveals to us the mind and heart of God. Through the gift of the Holy Spirit he opens our ears so that we may hear his voice and he fills our hearts and minds with the love and information of God. Loving Infant Jesus, fill us with your Holy Spirit that we may listen to your word attentively and obey it joyfully.